It is a question to be raised as to how I. H. K. Mahanama was appointed as the President’s Chief of Staff, when the investigation had been underway against him in relation to soliciting a bribe of Rs. 540 million from an Indian businessman, which was caught red handed recently, Centre for Human Rights (CHR) Executive Director Keerthi Tennakoon said. Addressing a news briefing, he said I. H. K. Mahanama was unaware until he was caught red handed that the Indian businessman from whom he had been solicited the bribe, had lodged a complaint to the Commission Investigating Allegations of Bribery or Corruption (CIABOC) about the initial stage of asking the bribe and added accordingly the CIABOC had commenced the investigations. “Although the said incident came into spotlight recently, there have been discussions with the President’s Chief of Staff Mahanama and State Timber Corporation (STC) Chairman P. Dissanayaka and the Indian businessman since May, 2017. Then and there, they have been threats to the businessman from the solicitors. In such a background, it is questionable as to how Mr. Mahanama was appointed to such a higher rank as President’s Chief of Staff,” Tennakoon said. 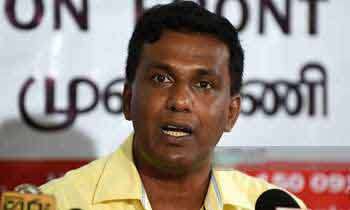 Meanwhile, he accused Prime Minister Ranil Wickremesinghe on his statement made at the UNP May Day rally that the Samurdhi Development Bank would be soon brought under the control of the Central Bank (CB). “If the Samurdhi Development Banks came under CB, it would be the end of the Samurdhi Banks and the deposited money of the poor would be wasted,” Tennakoon added. Are you not live in Sri Lanka? As correctly said by Ranjan the more corrupt you are you get higher positions . That's a foolish question. If the investigators blew the whistle he wouldn't be caught in action. Would have easily gotten away without substantial evidence. Keerthi.....not a big issue....his bosses wanted the guy to continue deals and finalize the bribe....so the extension was given. The Govt. should expedite investigations into allegations against former Ministers against whom startling revealationshad been made which could come under Bribery.These people have not understood the meaning of Disce Aut Disce De even though they have been at this famous school for over a decade. They have neither learnt nor departed in the political field as well. You are wrong. He Mahanama then became a secretary of Mahinda Rajapakse during his corrupt era. One look at this face will reveal the facts ... this man looks like the mason bass I hired to put up my parapet wall who later vanished with full pay and more money as a loan without completing the work. a chief of staff position is the most powerful position next to president or pm in any country. he can oversea all ministries. in this case its THIEF of staff like his backboneless president of a thief. It appears all top People are surrounded by opportunists, corrupts. There is a huge question mark and a controversy even on the appointment of the successor to State Timber Corporation (STC) Chairman P. Dissanayaka who got fired. Can a President of a country could be so naive? Cat's face is becoming visible through holes in the bag? Just imagine how grass roots level corruption might be. We still have not studied our double headed politicians. A behavior before the election and a totally different one after the election. Should we trust any of them? It just shows, if the deal sails through everyone is a winner, if it doesn't the one caught is caught.... that's how the system operates in our 2000 worth culture that we boast - so no harm in appointing thieves and chiefs! !